Let’s face it, deploying with Salesforce can be frustrating. You’re either using change sets or Ant scripts and both have their issues. Ant scripts require meticulous tweaking of your code and constant customization. You can spend hours working on a script only to find that the metadata API or Ant tool doesn’t fully support the Salesforce metadata type that you’re trying to deploy. Change sets are even more manual. You have to remember all the changes that you’ve made or log them diligently. Many of the teams we talk to resort to spreadsheets and it isn’t pretty. Assuming you accurately capture all changes, you then have to create the change set manually. Many times it will fail to deploy if it’s an even moderately complex deployment. Worse, you have very little sense of why it failed so you have to go through an elaborate and time-consuming debugging process which involves creating multiple change sets. Trial and error is not a fun process in this context. 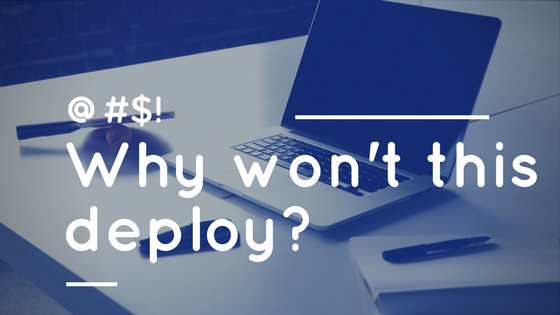 Blue Canvas makes this process much easier because it answers a key question: Why can’t I deploy? 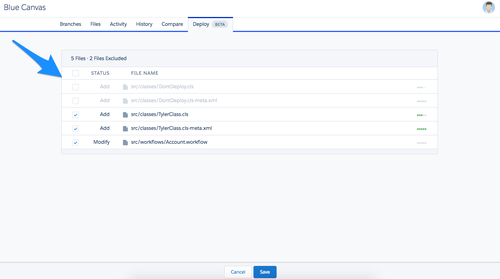 Blue Canvas automatically tracks changes so you always know at any moment what has changed and what is available to deploy. 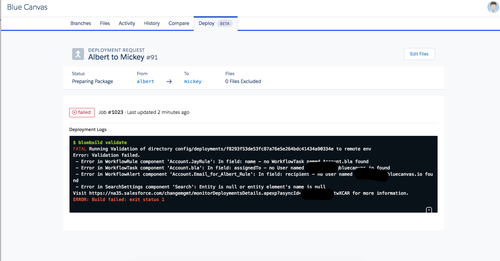 You can compare between any two orgs and create a deployment request with your changes. You no longer need to manually track down changes - this is especially useful when you have a few people working on the org. If you see this error you know that the issue is simply the lack of that logo. So you can just upload the logo manually and automatically run the deployment validation again. - Error in MyAction component 'SendEmail': Send Email is disabled or activities are not allowed. Enable Send Email and allow activities, then try again. - Error in ConnectedApp component 'ContosoSSO': The consumer key is already taken. Once you’ve figured out what is wrong, you can rerun your deployment with a click of a button. No need to manually recompile a change set. You can also cherry pick out files that you want to ignore in the deployment and run again. Salesforce deployments are still complex animals. There are so many dependencies you may need to include some manual steps. But the log that Blue Canvas generates will save you tremendous amounts of time, money and headache.